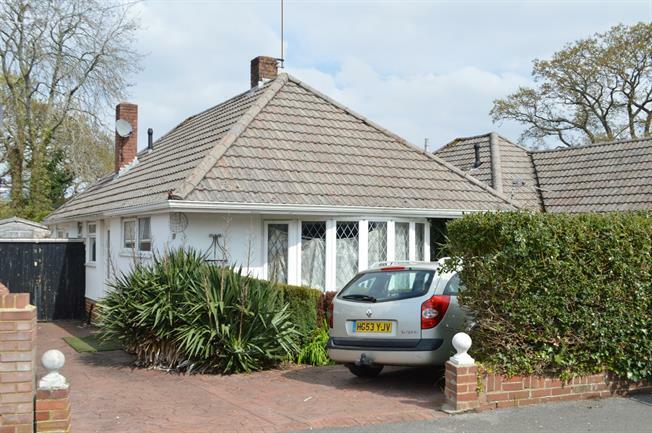 2 Bedroom Detached Bungalow For Sale in Bournemouth for Offers in excess of £280,000. CASH BUYERS ONLY - OPEN WEEKEND 27TH AND 28TH APRIL - CALL 01202 534301 FOR YOUR APPOINTMENT - Palmer Snell are pleased to offer this 2 double bedroom detached bungalow requiring modernisation throughout and with potential structural issues situated in a desirable location in Muscliff backing onto woodland and the river being offered with no forward chain. The accommodation has scope for a loft conversion STP comprises an entrance hall, 19'10" lounge, 12'4" kitchen/breakfast room, 2 double bedroom, bathroom with separate WC, gardens to the front and rear and a garage. Via UPVC double glazed door. Radiator. Loft hatch. Airing cupboard. Doors to accommodation. UPVC double glazed bay window to front aspect and window to side aspect. Radiator. Fireplace. TV point. Space for table and chairs. 2 UPVC double glazed windows to side and rear aspects. Range of wall and base units. Sink. Space for appliances. Tiled walls. Radiator. Integrated oven and hood. Space for table and chairs. UPVC double glazed patio doors to rear garden. Plumbing in for radiator. Frosted UPVC double glazed window to side aspect. Wash basin. Bath with shower over. Tiled walls. Heated towel rail. The front of the property is mainly hard standing with scope for off road parking subject to a drop curb. Access through double gates to the rear garden and garage. The rear garden with back onto woodland dropping down to the river bank has a patio off the property with the remainder laid to lawn. Pond and water feature. Shed space.